(Newser) – Jared Kushner may be a top adviser to President Trump, but his authority to view classified information is looking dicier by the day. In fact, it may already have been revoked. As part of chief of staff John Kelly's newly tightened restrictions in the wake of the Rob Porter scandal, those without a permanent security clearance could be barred from seeing classified information as of Friday. Kushner remains in that "interim" group, and his father-in-law made clear on Friday that while he could overrule Kelly, he would not do so. “That’ll be up to Gen. Kelly,” Trump said at the White House, per Politico. “Gen. Kelly respects Jared a lot and Gen. Kelly will make that call. 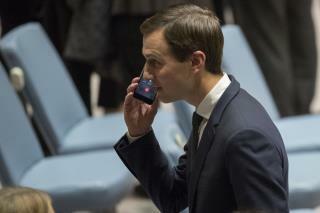 I won’t make that call.” Based on a new Washington Post story, Kushner's permanent approval by the Justice Department still has a ways to go. If Donald Trump weren't president, he wouldn't get even a minimal security clearance; thus, his naming a relative to a post requiring a security clearance should be nullified. Jared Kushner was a campaign volunteer who worked for a little while. I wouldn't recognize him if I saw him. He has NOTHING to do with the Trump administration.